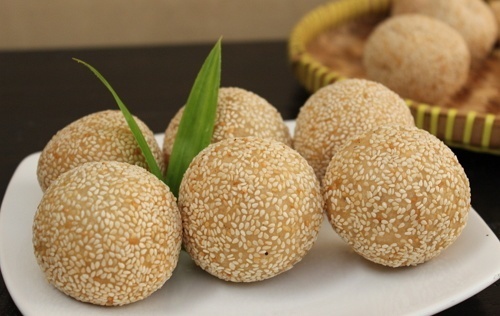 Onde-onde, one of the traditional cakes are popular in Indonesia, especially in Mojokerto. These snacks are usually sold at a cake shop or in the street vendors. First we create it first. Please boiled green beans along the water until the texture is mushy. Next add the sugar and coconut milk, stir until the dough is mixed and well attached. Turn off the stove, and berntuk dingingkan dough round. Next we create the skin. Prepare a container size is rather large, and then enter the glutinous rice flour, sugar, and potatoes. Add coconut milk little by little, then stir the batter until completely smooth and well blended. Take the dough skin, then enter the dough in it. The round shape as much as possible, then roll over sesame prepared beforehand. Heat a frying pan and fry the balls ondenya to change color to golden yellow or brownish. Remove and serve while warm. Well, so much for the cake recipe this time.